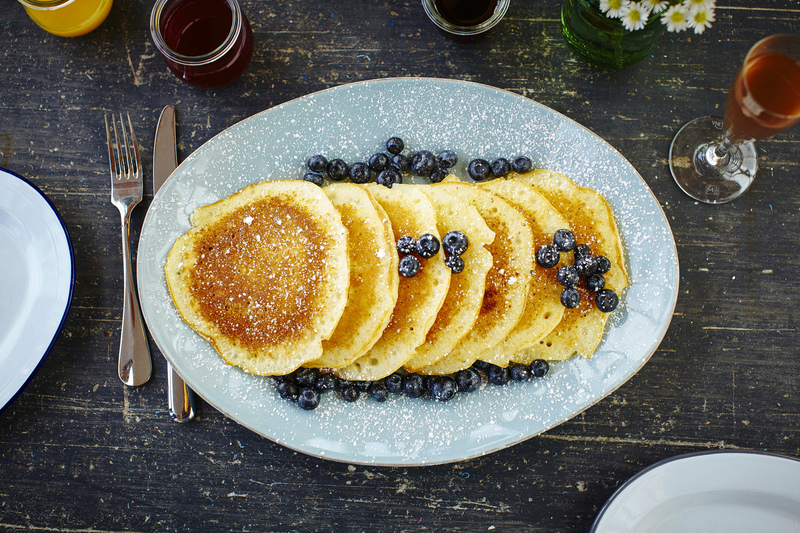 Believe it or not, pancakes are even tastier when eaten alfresco. 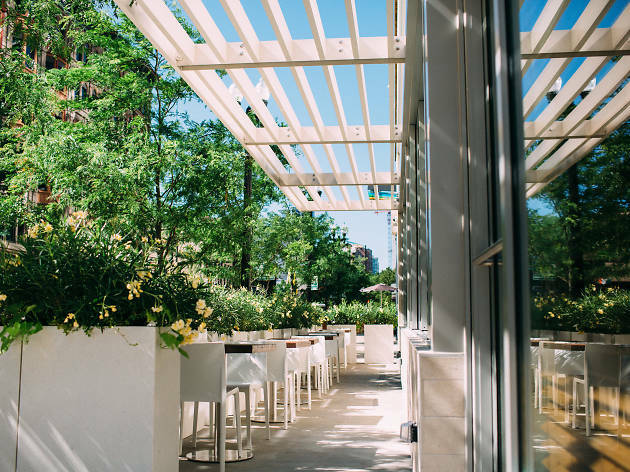 Here's where to enjoy brunch outside this summer. 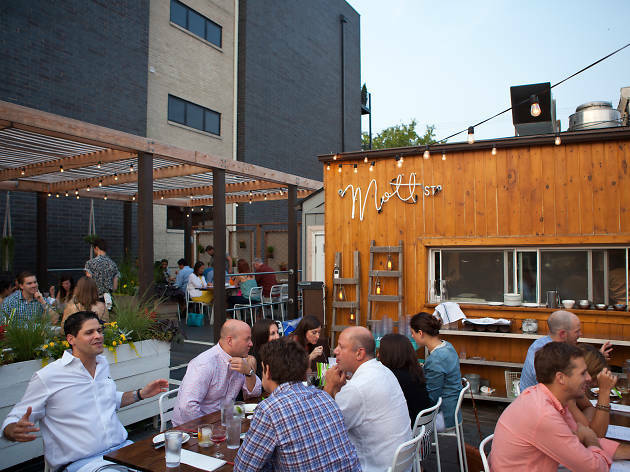 During Chicago's summer months, we look for any excuse to be outside. We pack picnics for outdoor movies, sip cocktails at the city's best rooftop bars and attend as many street festivals as humanly possible. 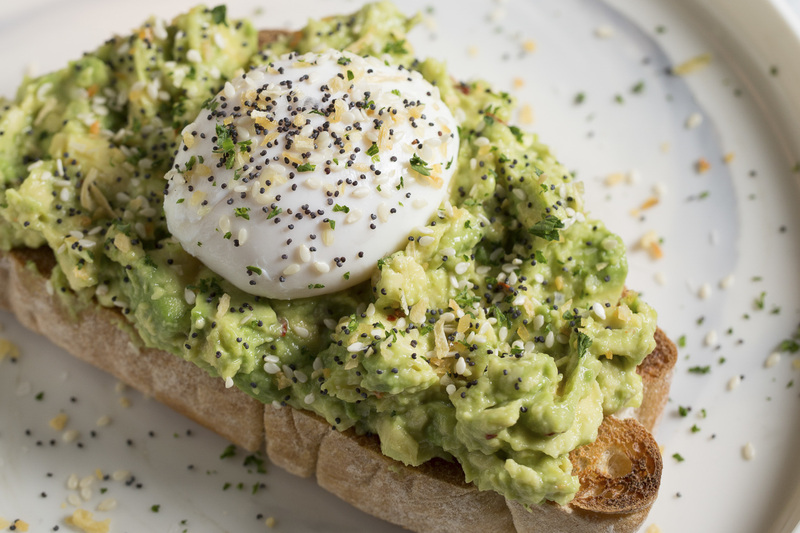 Why should brunch be any different? 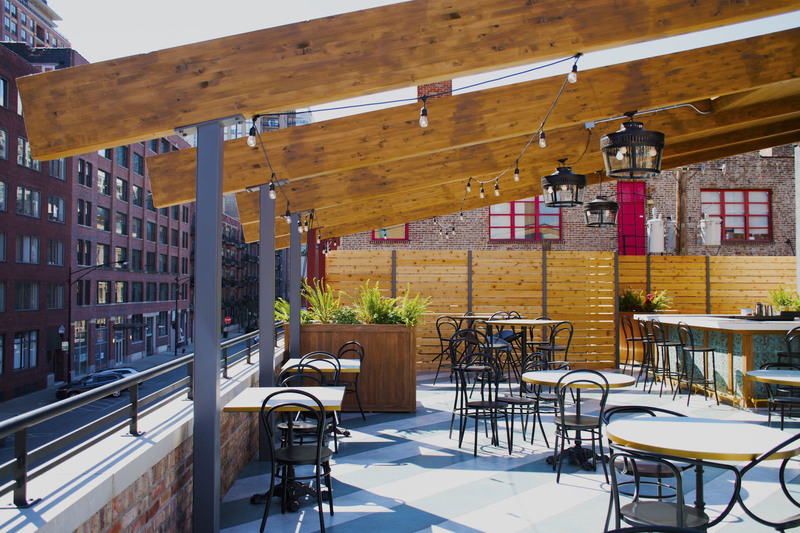 When the weekend rolls around, look to Chicago restaurants with patios, beer gardens and rooftops for your early-morning dining needs. 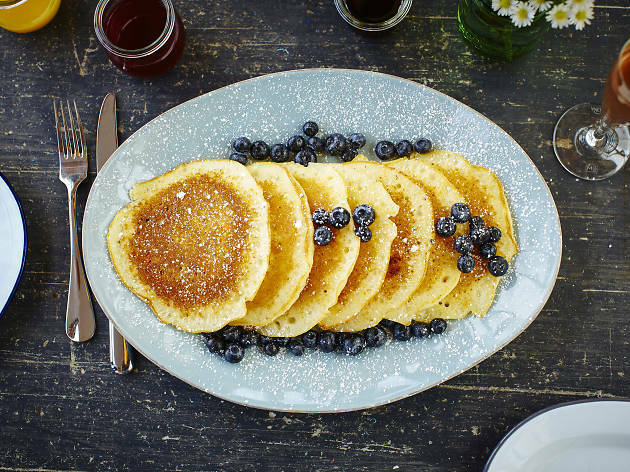 Before you know it, you'll be soaking up the sun with a mimosa in hand and a stack of pancakes in front of you. 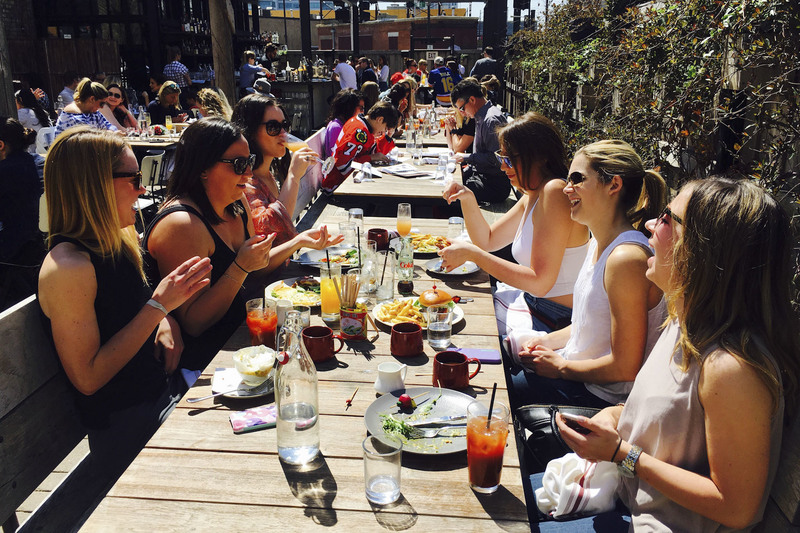 Here's where to find Chicago's top alfresco brunch options. 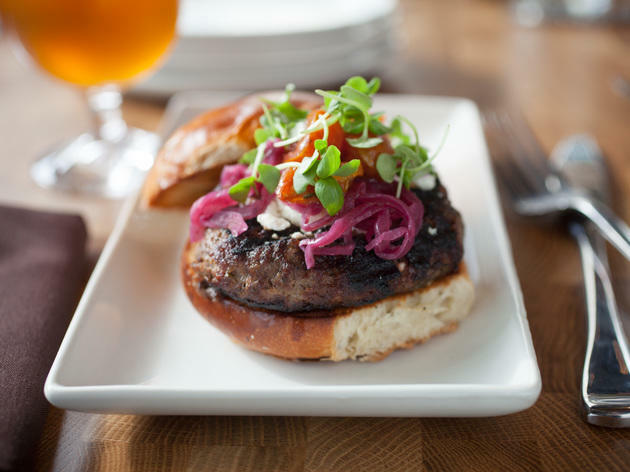 The rooftop restaurant and bar at the Chicago Athletic Association Hotel offers some of the best views of the city, with an expansive look at Millennium Park and the Lake. 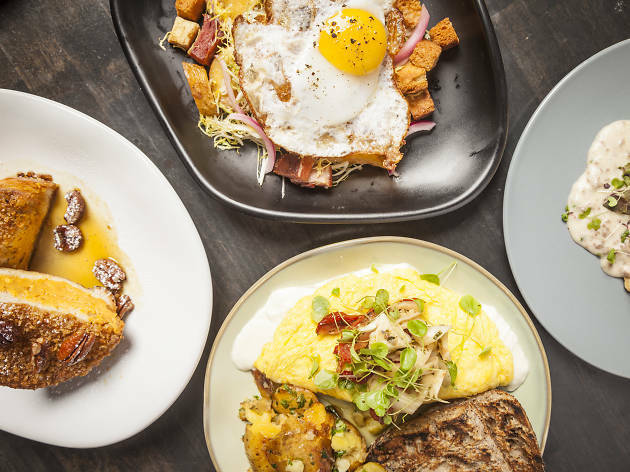 The brunch menu is just as impressive, with shareable plates like lox and bagels, buttermilk pancakes and a seasonal fruit platter. 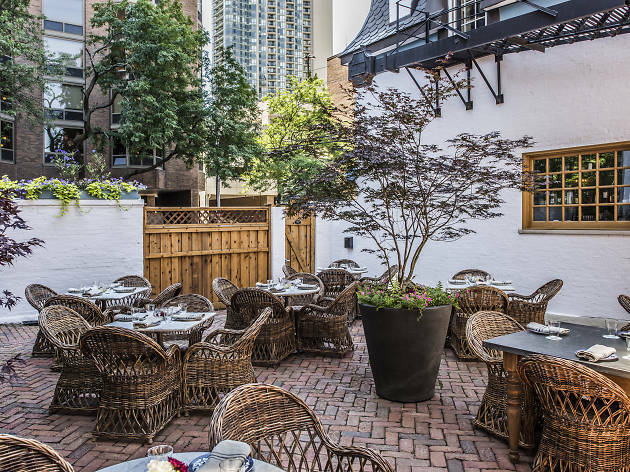 Clink wine glasses and down plates of house-cured king salmon, avocado toast and Spanish tortilla on this intimate 36-seat patio in River North. 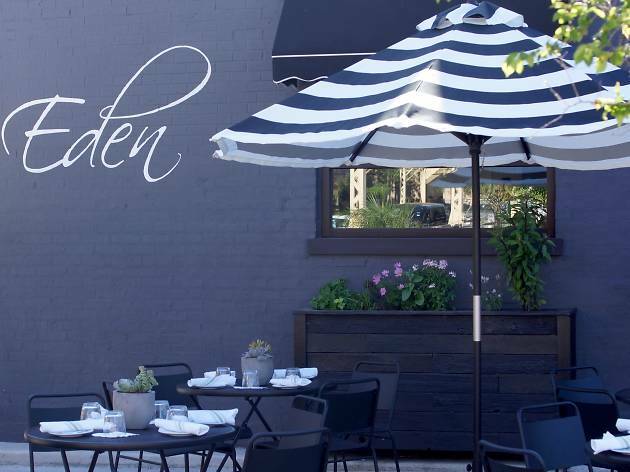 Soak up the sunshine on Eden's 20-seat patio while enjoying seasonal New American bites, including a Black Forest ham crepe, grilled avocado eggs Benedict and quinoa cakes with caramelized pineapple syrup. Grab breakfast in Bridgeport and get some sun while you're at it. The Duck Inn's bi-level backyard patio is surrounded by a working vegetable garden, making it a lush retreat when the weekend rolls around. Select from hearty brunch fare like the Egg McDuckInn, with American cheese, two sausage patties, caramlized onions and a fried egg. 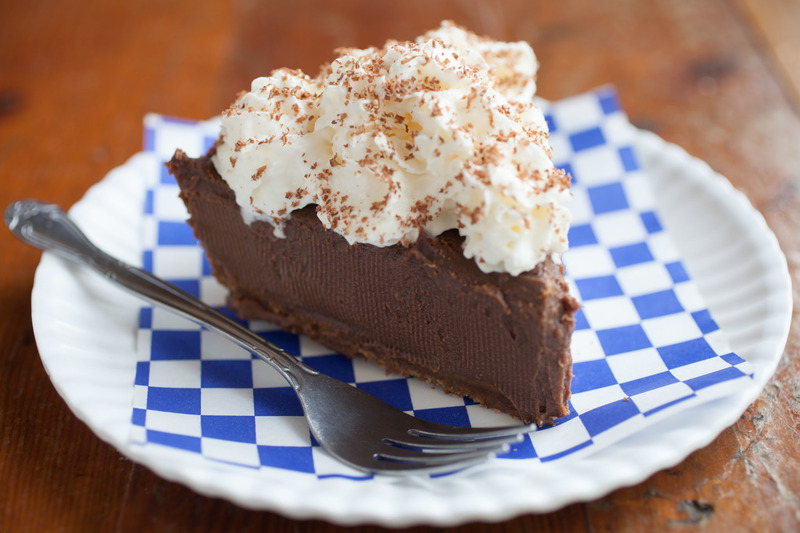 On Saturday and Sunday, Bang Bang's Logan Square location opens at 9am with brunch favorites like candied bacon, cheddar grits, sausage-topped biscuits and pie (yes, pie is part of a complete breakfast). Take your order outside to the sunny, spacious patio, where pups are welcome to join. Tucked away in the Gold Coast, Blue Door's lush, romantic patio is a hidden escape surrounded by fresh flowers and a chef's garden. 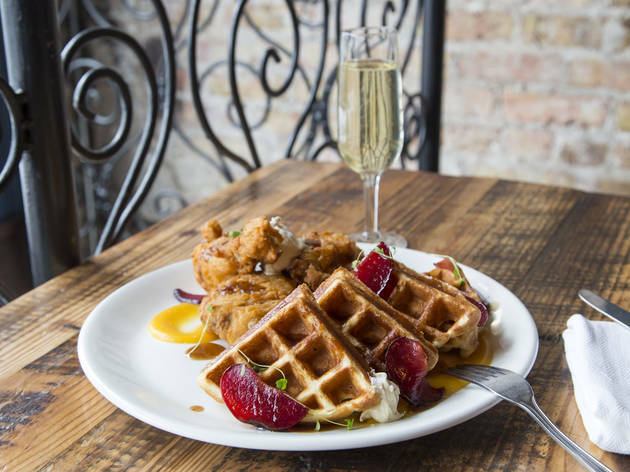 The menu matches with flower-forward cocktails and delightful brunch dishes, like vegetable hash, the s'more waffle and lox Benedict. It's all too easy to spend the afternoon sipping frozen cocktails on this sprawling, sun-drenched patio. 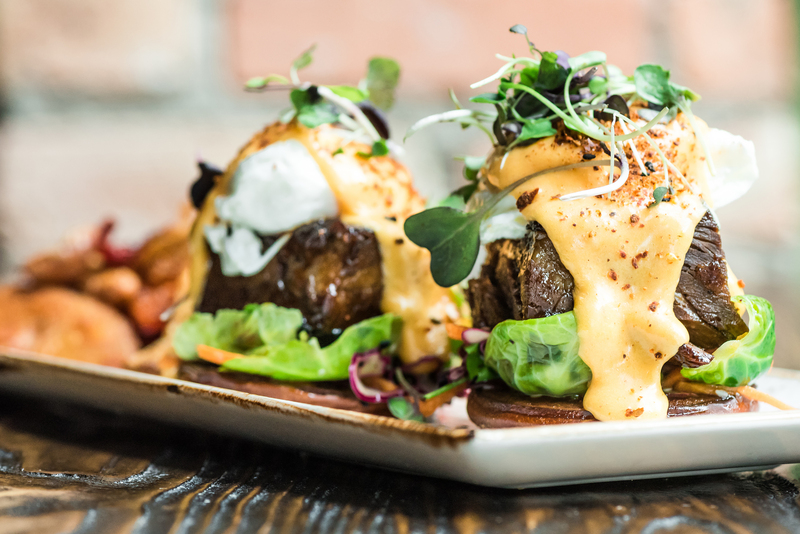 But first: Coat your belly with brunch favorites like the chorizo hash, which is covered in chihuahua cheese, pickled jalapeños and a sunny-side up egg. Sweet seekers will love the bread pudding French toast with coffee mascarpone, candied walnuts and brûléed banana. 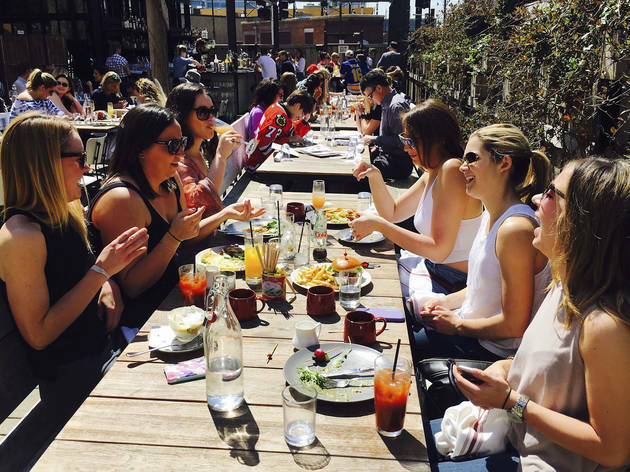 A trip to Pilsen wouldn't be complete without a stop at Dusek's, and there's no better time to visit than weekend mornings, when you can grab brunch on the small patio that rides the side of the building. 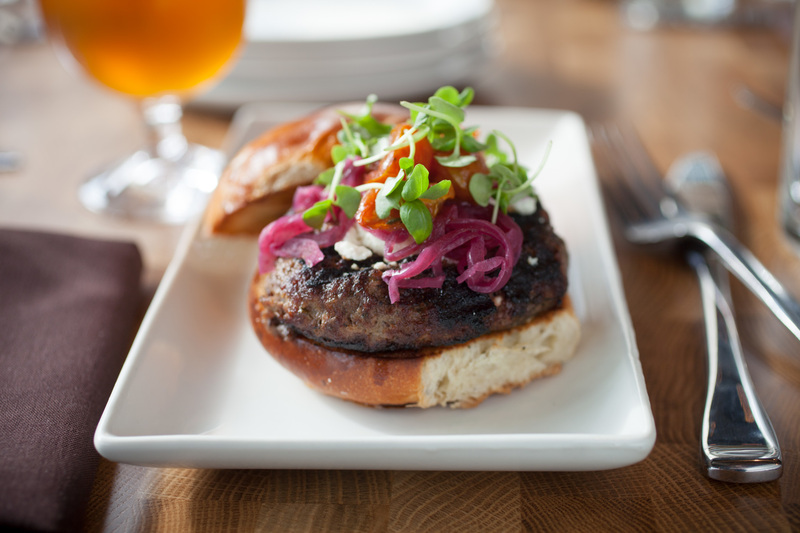 Order a sticky bun for the table before making tough decisions: Fried chicken and waffles or steak and eggs? A Bloody Mary or a michelada? 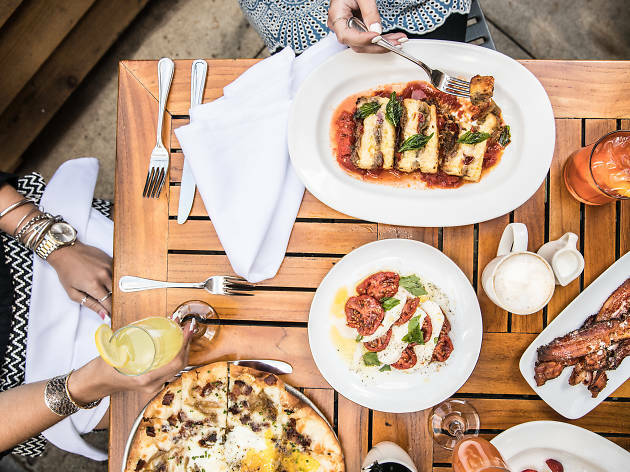 With room for 68 people, the gorgeous, dog-friendly patio at Mott St. is a damn good time when the weekend rolls around. 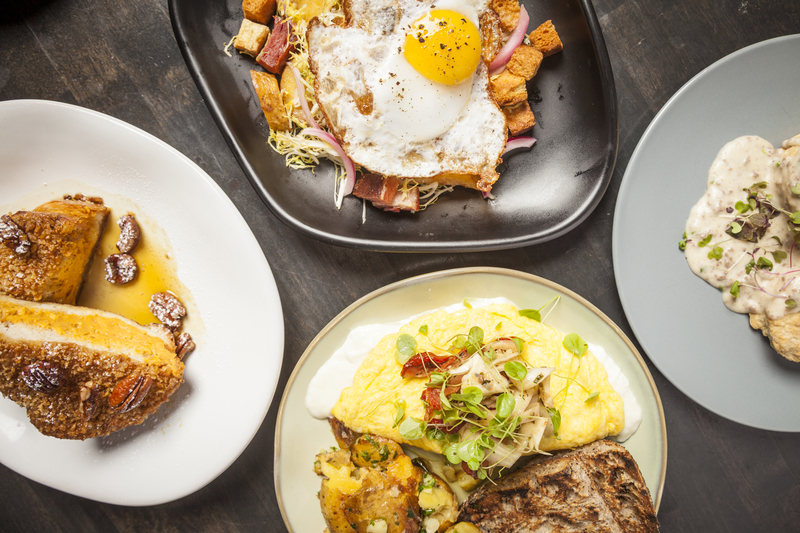 And with tasty treats like kimchi fried rice and coconut pancakes, it's a fool-proof bet for brunch. 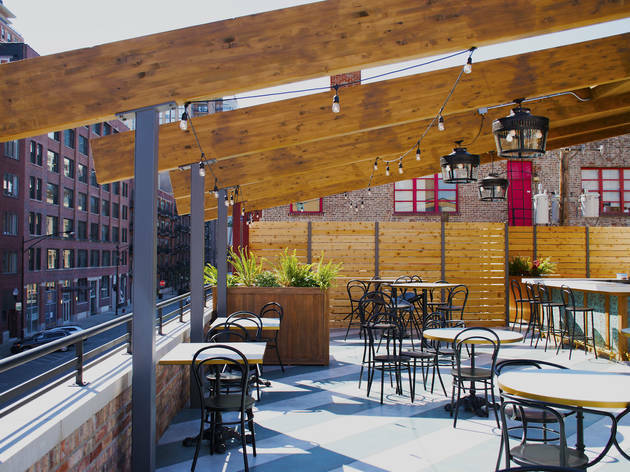 Just when we thought this chic Lakeview restaurant couldn't get any cooler, they went and added a sidewalk patio. Start brunch service with a bottle of prosecco alongside a trio of fresh fruit juices, then hop into entrees like the decadent quiche with mushroom, artichoke, tomato and baby greens. 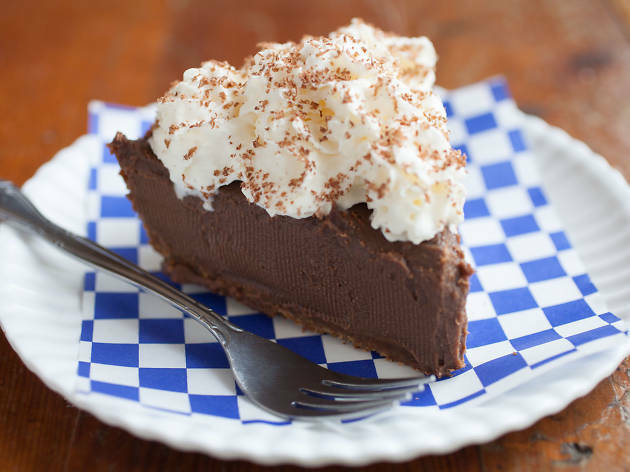 Switch up your brunch routine at this Bridgeport darling. 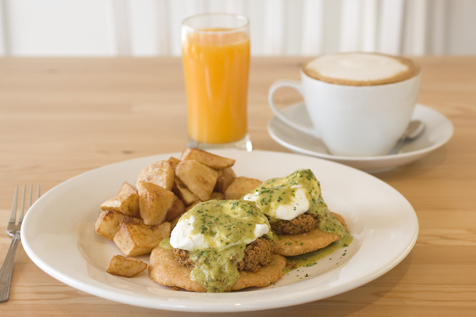 Nana specializes in organic cuisine with an emphasis on seasonal produce, so expect a rotating menu with options like a garden omelet, strawberry-rhubarb French toast, avocado fries and a tofu scramble. 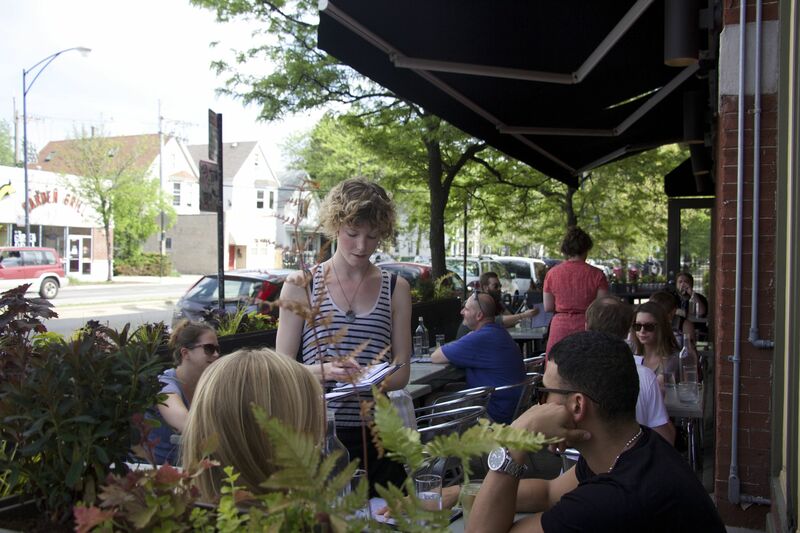 All the better if you can snag a seat on the sunny patio out front. 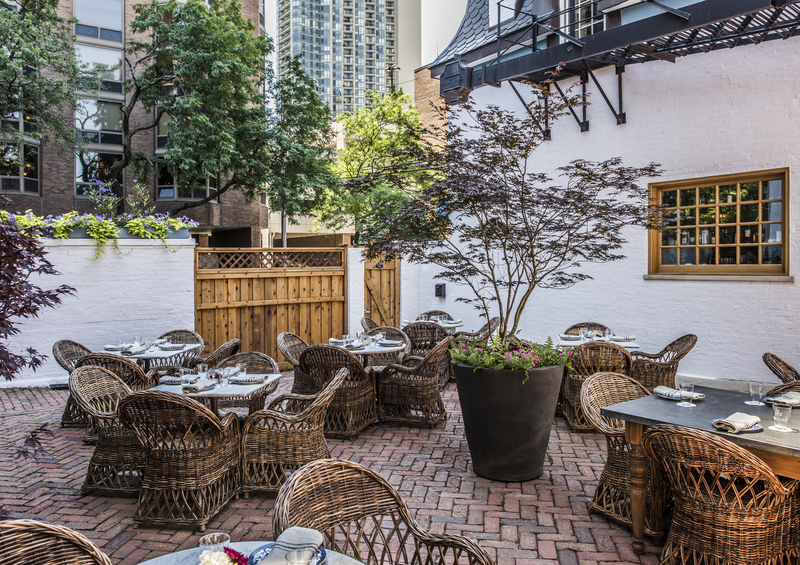 Bernie's small rooftop oasis is a hidden gem in busy River North, and it's worth seeking out for delicious Mediterranean-inspired brunch bites like lox and pita, lamb hashwi and a blueberry acai bowl. 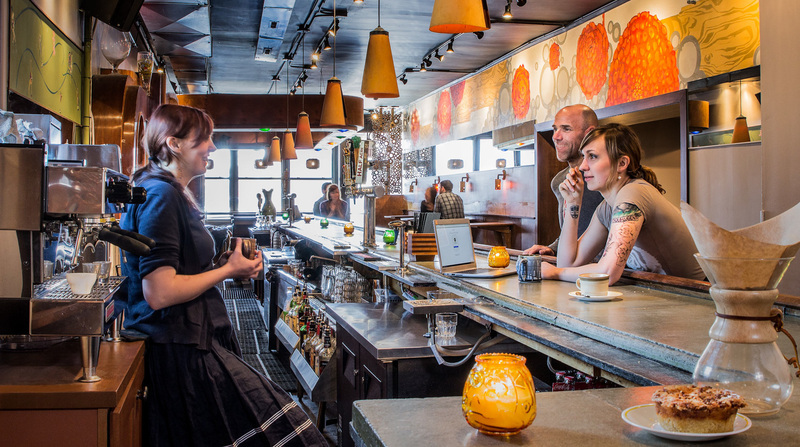 Order a plate of house-made doughnuts while you wait for your entrees. 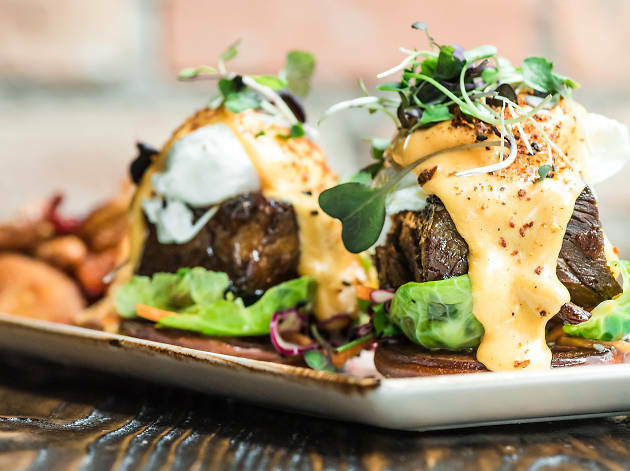 If you're searching for a dog-friendly brunch spot in West Loop, Mad Social has you covered with a 32-seat patio and hearty, hangover-curing brunch options like Havarti mac and cheese, pancakes with salted caramel and a short rib Benedict. 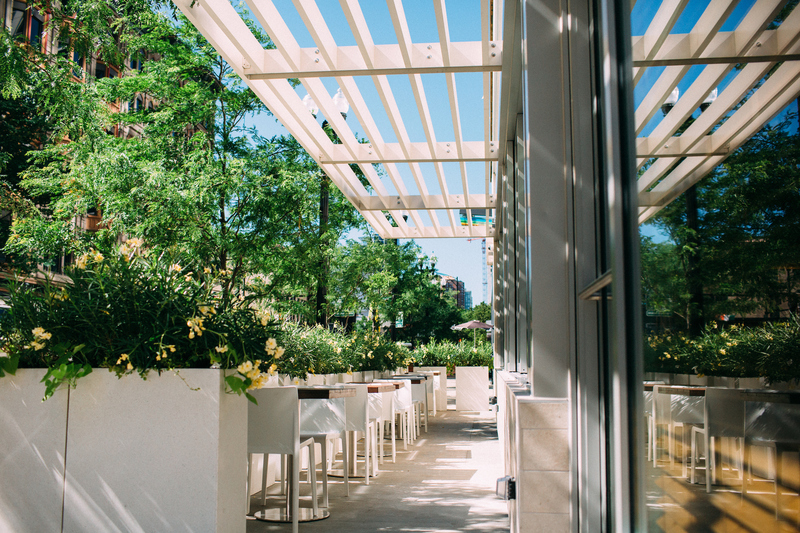 Lined with flowers and shaded from the sun, this Hyde Park patio is an easy, breezy weekend decision. 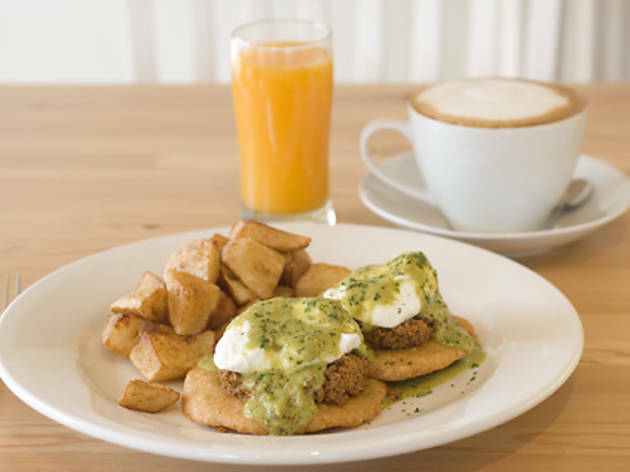 You'll have a harder time deciding between the dulce de leche French toast and the savory chilaquiles topped with tangy salsa verde. The good news is there are no bad decisions. 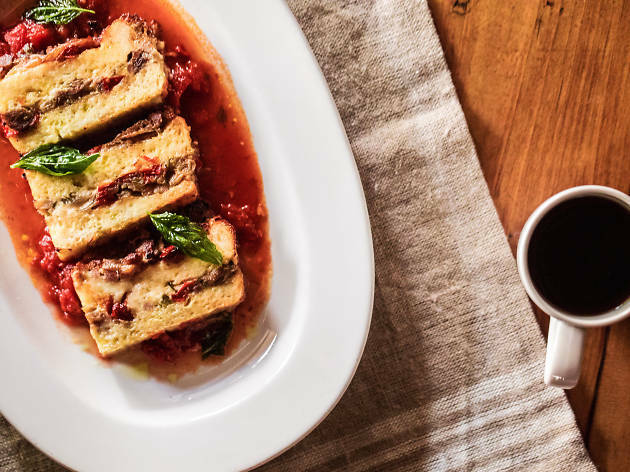 Who says you can't tuck into your favorite Italian dishes before noon? 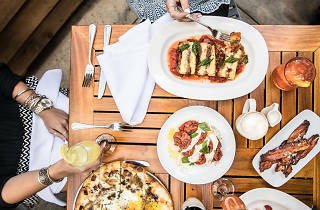 At Osteria Via Stato, hungry brunch revelers can nosh on hearty veal meatballs, an open-faced Italian sandwiches, ciabatta French toast and more. Plus, opt to build your own bellini using prosecco and assorted seasonal fruit purées. 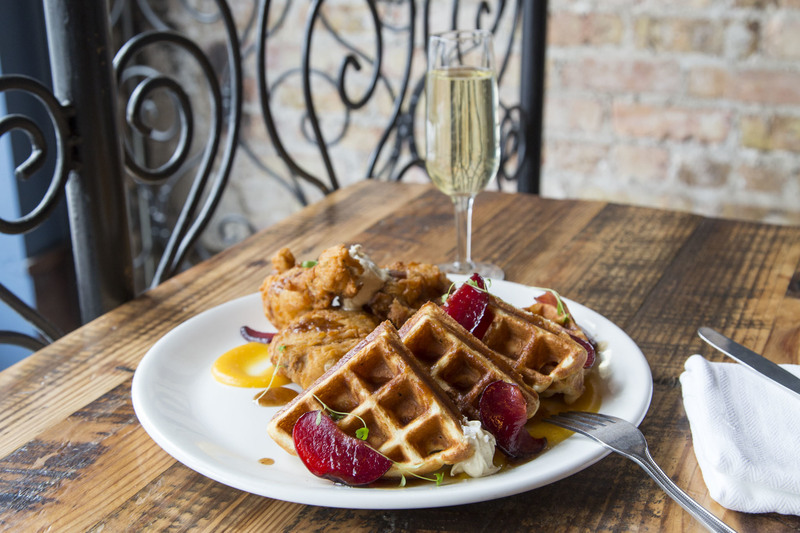 For an especially boozy brunch, head to Logan Square to sip bellinis, drafts and Malört (yes, Malört). When hunger strikes, toss in crispy fried French toast, a potato chip frittata or an egg sandwich. If you're seeking brunch with an epic view, look no further than the LH Rooftop at LondonHouse. 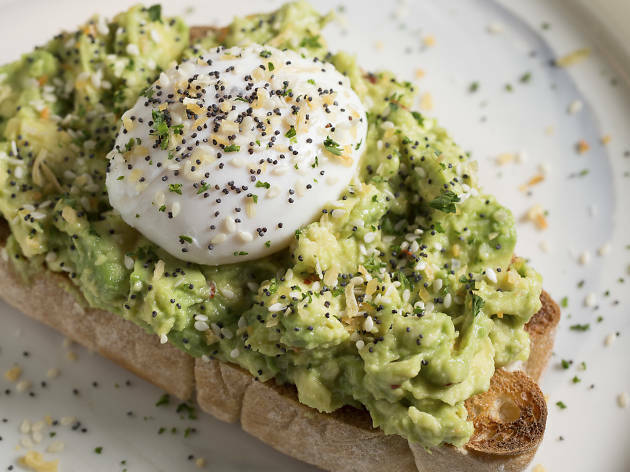 Perfect for visiting parents or out-of-town guests, the gorgeous space offers upgraded brunch favorites like a king crab Benedict, seared redfish and heirloom tomato toast. Of all the neighborhood bars trying to make rambling Ashland Avenue feel more homey, this gem is among the homiest. 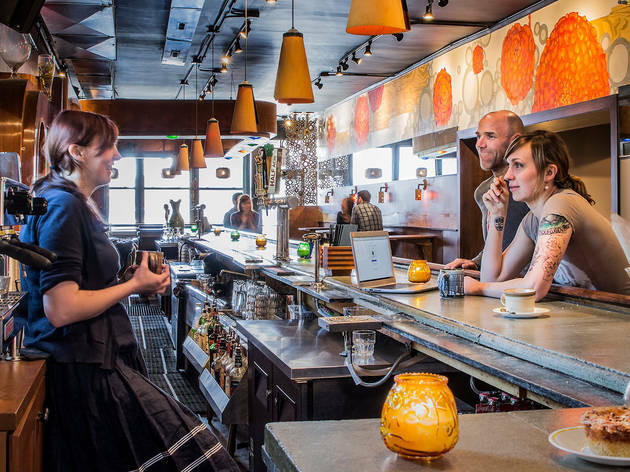 If you find yourself here before noon, get familiar with the Biscuit Man, offering fresh house-made biscuits, sandwiches and salads.